What kind of physical shape do I need to be in to trek in the Everest region of Nepal? When is the monsoon (rainy) season in Nepal? What is the weather like in December? Is it safe to bring children to high altitudes? Could you give an example of a typical breakfast, lunch, and dinner on the trek? 1. What kind of physical shape do I need to be in to trek in the Everest region of Nepal? Being in good cardiovascular condition and having strong hiking muscles will help you make the most of your trip. Days are generally long, but we move slowly and take a number of breaks to allow for acclimatization. Begin training today if you want to get the most from this trip. 2. When is the monsoon (rainy) season in Nepal? What is the weather like in December? The full monsoon season in Nepal is typically from mid-June to mid-September. July and August are the rainiest months. December is one of the sunniest months in the Khumbu region of Nepal and it is statistically the driest month. Daytime temperatures are generally cool, comfortable, and usually well above 32°F/0°C. In a cold spell, it may drop below freezing overnight, but you will feel cozy in the warm sleeping bags we will provide. In Kathmandu, temperatures are usually mild in December with an occasional morning frost late in the month. 3. What about high-altitude acclimatization? You will notice on the itinerary that we take 5 days to walk from Lukla at 9,200ft/2,805m to Pangboche at 13,123ft/4000m. At Namche and Pangboche, we take rest days to allow our bodies to adapt to higher altitudes and to rest our muscles. This schedule, combined with a conscientious attitude towards our own bodies and to one another, has proven successful time after time. 4. Is it safe to bring children to high altitudes? There is no evidence to suggest that our maximum altitude of 13,123ft/4000m is unsafe for children, or adults for that matter. 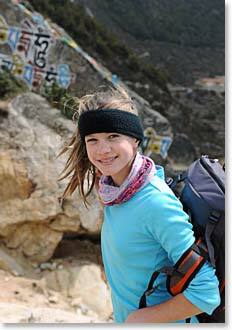 In our experience, children and adolescents acclimatize just as well as adults and are no more susceptible to altitude symptoms. The biggest concern with children is that they may not be as aware of how they are feeling or as likely to tell you if they are feeling ill. To remedy this concern, we recommend that you ask them specific questions such as, “Do you have a headache?” and “How did you sleep last night?” Your guides will also help you monitor your own health as well as your children’s and will help you make good decisions. We have carefully crafted our trekking schedule with acclimatization in mind, so we do not anticipate that anyone will have problems. Even so, we always suggest that you visit a doctor before embarking on any journey abroad (that goes for adults too). 5. What size of backpack do I need? You will want a medium sized rucksack (2,500-3,500 cubic inches or 40-55 liters) that can hold your layers of clothing for temperature changes throughout the day. The porters and yaks who will carry your large duffel bags, do not necessarily move at the same pace as you, and they almost always leave earlier in the morning than you will. The items you carry with you each day are largely what you will need when you are inactive, rather than what you need to hike in, such as the jacket and hat you wear before the sun hits in the morning, or the camera and notebook you use to record your impressions during breaks. Do not follow advice to bring a smaller pack so that you will carry less. Packs that are slightly larger distribute the weight on your back better and are much easier to pack, especially with cold fingers! 6. 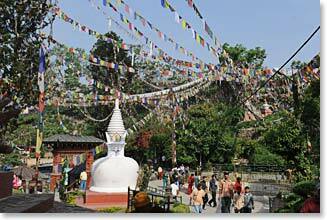 What are accommodations like in Kathmandu and while trekking? In Kathmandu, we stay at the Yak and Yeti Hotel, or another of Kathmandu's finest hotels. While trekking, we stay in clean and friendly Sherpa lodges. Our own cook staff will prepare all meals. For more information about why we choose lodges over tents, read our Lodges versus Camping in Nepal article. Hot showers, with gravity-fed water heated on gas stoves, are available throughout the Khumbu. In the lower villages such as Namche, you will have solar-heated showers in your private rooms in the lodges. As you go higher, washing facilities become simpler, but are always available. At the highest altitudes the showers are less likely to be used because outside temperatures are cold, but in these areas our Sherpa staff will provide small quantities of heated washing water each day. Warm washing water and soap for hands is also provided before each meal, and we insist you use it! 8. Could you give an example of a typical breakfast, lunch, and dinner on the trek? Our Sherpa cooks are masters at preparing a variety of healthy meals. They use almost exclusively fresh, whole ingredients. Produce and staples are purchased in the Kathmandu Valley and transported to the Khumbu via helicopter. Fresh meat and other supplements are purchased in Namche or along the way. It is very easy for us to accommodate vegetarians in Nepal because meat is served, but is always an addition to the main courses. Dal Bhatt (rice with lentils) and several other local Nepalese and Tibetan dishes are featured throughout our trek. They quite often become the favorites and are the "most requested", but there are always other options at any meal where they are served. We are happy to accommodate special dietary needs including vegetarian, vegan, and gluten-free diets as well as food allergies. Breakfast: Porridge, corn flakes, instant milk, fried eggs, toast with jam and butter, and orange slices. Coffee, black and herbal tea, hot chocolate, or Tang to drink. Lunch: Yak steak with French fries, rice with lentils, cauliflower, toast with peanut butter and jam, cookies, fresh apples, hot drinks, and Tang. Afternoon tea: Popcorn, saltine crackers with sliced cheese, and hot drinks. Dinner: Soup, pizza, fresh green beans, mashed potatoes, banana fritters, and hot drinks. Photography on a trip to Nepal can be especially rewarding. Plan to take pictures of people, especially close ups of smiles and expressions. You will not forget to take pictures of the grand scenery all about you: Everest, Ama Dablam, Pumori, and the other great peaks. A camera that you are familiar with will be better than one you are learning to use. Small point-and-shoot cameras, both digital and film, will always be used because they can stay handy in your pocket. However, inexpensive point-and-shoots can become unreliable in cold temperatures and dusty conditions. They are great while are they are working, but if this is your only option for photographs you may regret it. Digital and analog video cameras are great if you take care to plan for your power needs. Rechargeable ni-cad batteries are more affected by cold temperatures than the manufacturers lead you to believe. You will be able to recharge your batteries at many of lodges we use in the Khumbu, but bring plenty of batteries and make sure you have adaptors to use your equipment with electrical outlets in Asia. 10. Do you have access to radio communications for any emergency needs? Our primary means of communication with Kathmandu and the rest of the world is our satellite phone. We also carry cell phones because cellular services in the Khumbu region are quite good. We should have cell phone coverage all the way to Pangboche. In addition to our phones, regular phone lines are available as far as Tengboche. Pay-phones (satellite) are sometimes available all the way to Gorak Shep. If you wish to use your own cell phone from home, be sure to check with your provider about using your phone abroad to avoid unexpected fees and rates.